Are you an experienced Taxi driver looking for a new role or are you looking to break into being a taxi driver? Look at what previous work experience you have and how this relates to driving especially driving other people (passengers) around, what have you done in the past that is similar that you can show to a potential new employer? 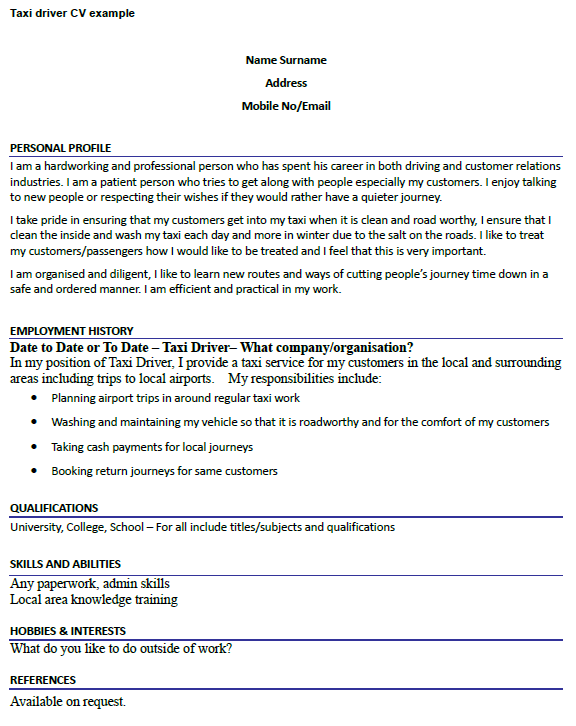 Also when looking at updating your CV, because of the nature of the role you will also need to have good customer service skills as you will be dealing with passengers using your taxi service and you will also be required to be familiar with the area that you are working in and have a good knowledge of local street names etc. In some towns you may also be required to pass a exam/test as to your knowledge. I am a hardworking and professional person who has spent his career in both driving and customer relations industries. I am a patient person who tries to get along with people especially my customers. I enjoy talking to new people or respecting their wishes if they would rather have a quieter journey. I take pride in ensuring that my customers get into my taxi when it is clean and road worthy, I ensure that I clean the inside and wash my taxi each day and more in winter due to the salt on the roads. I like to treat my customers/passengers how I would like to be treated and I feel that this is very important. I am organised and diligent, I like to learn new routes and ways of cutting people’s journey time down in a safe and ordered manner. I am efficient and practical in my work. Date to Date or To Date – Taxi Driver– What company/organisation?